I am returning today from a meeting with a potential business partner. The meeting was exciting, not only because of the discussion we had about the possibility of working together, but because of the strong spirit of innovation and social conscience I saw embedded within their organization. I have been thinking about this on my flight back, and wonder what our world would look like if people everywhere had the same opportunity to innovate in ways that make our world better; the creative spirit of people is squashed in so many ways in our society. Unleashing this spirit is at the heart of our Healing America Campaign. I believe we need an alternative to top-down approaches, which are often corrupt, inefficient, and innovation-stifling. We need a new approach that empowers people in local communities to engage in solutions – a paradigm that unifies people around the idea of local, constructive action, all embedded within a larger network of connected communities so that innovation can ripple out from one community to another. I am happy to report that we are making good progress with our Healing America Campaign. Much work is happening behind the scenes, with a significant amount being done by passionate volunteers in several communities across the country. Their effort further underscores the wisdom of our approach. More to come, and until then, we appreciate your continued support. With busy summer schedules, now is the perfect time to stock your freezer with delicious, convenient, healthy plant-based meals! 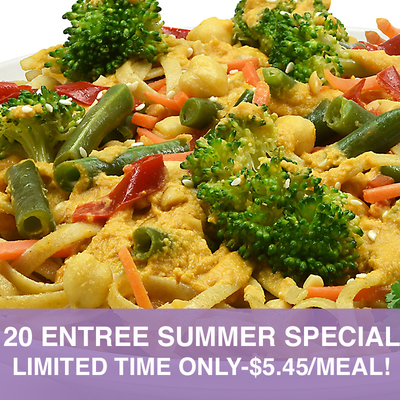 For a limited time, we are offering a select 20 pack of our meals for only $109 or $5.45 per meal. 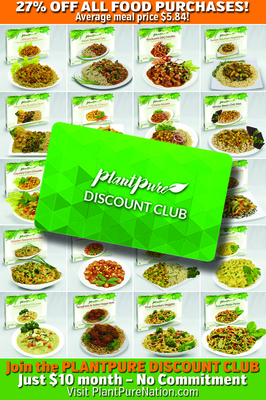 If you are a Discount Club member, you can get this same deal for only $79.57 or $3.97 per meal. Once these special packs are gone, they’re gone, so order today! Jeff Sandborn lived a pretty average lifestyle following the motto “everything in moderation”. That is why he was surprised to find himself being flown by helicopter to a hospital at the age of 46, where doctors put two stents in him. He was only slightly overweight (35 - 40 lbs), had only slightly high LDL (112-118 mg/dL), and ate everything in moderation. The surgery definitely got his attention and he began making small improvements with his eating habits. Fast forward 2 ½ years and Jeff found himself only slightly healthier. He still took medications for cholesterol and high blood pressure and still had 15 - 20 lbs to lose. Several things happened that changed the direction of his life. First, a friend and business supplier mentioned that his wife had started him on a plant-based diet and both his cholesterol and weight had dropped significantly. 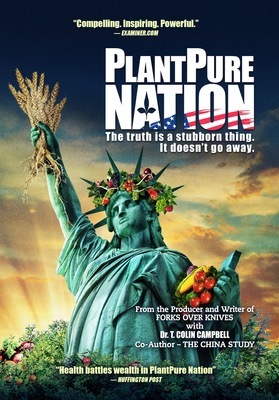 Second, someone told him about PlantPure foods. 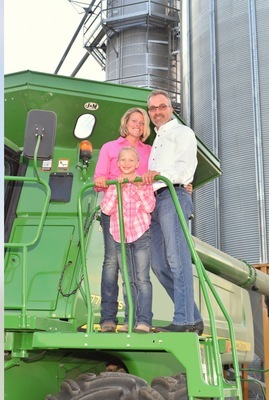 Jeff is a farmer and spends long hours working, so finding the time or energy to prepare his meals was challenging. He found that heating a PlantPure entree was easy, convenient, and delicious. Finally, he also had the realization that if he did not make significant changes, he would be on medication for the rest of his life, and that was not something he wanted. Due to the combination of these events, he made the decision to go all in and become plant-based. The results were amazing. Within a few months, Jeff’s weight dropped close to his high school weight and his LDL plummeted to 70 mg/dL without medication! Jeff’s goal was to create a lifestyle that would last a lifetime, without going back and forth on fad diets. He is quick to point out that he is not perfect and every now and then he allows himself a slice of pizza. He feels that just knowing he has that flexibility makes this lifestyle something that is both manageable and enjoyable. Stay Updated On PPC Happenings! 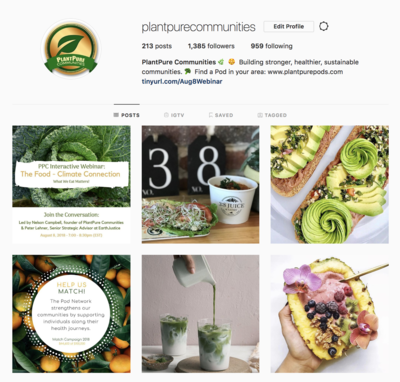 You can stay up-to-date on what's happening at PlantPure Communities by following them on Facebook, Instagram, or Twitter! See what's happening in the Pod community groups and Oasis Pilots, find out about ongoing and new initiatives like the Restaurant Campaign and Get Growing, participate in the latest webinars, and much more. This recipe happened because of a frantic evening without much in the fridge and a limited amount of time. I had some marinara sauce, pasta, a few veggies, and pantry spices, so after careful consideration, the Instant Pot seemed like the perfect solution. 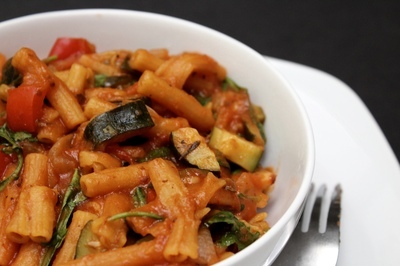 The result was an amazing rich creamy pasta dish loaded with hearty veggies. We felt like we had ordered pasta from a fancy Italian restaurant! Cooking the pasta with the marinara sauce gives this dish a unique creaminess that you simply cannot capture on the stovetop. Instant Pot does it again! Using the sauté feature on the Instant Pot, sauté the onions, peppers, and jalapenos on high heat until tender. Turn off the heat and add the garlic and zucchini. Place the remaining ingredients, except the spinach and/or kale, into the instant Pot and stir briefly. Be sure to use the exact liquid measurements since your pasta results depend greatly on the liquid amounts. Close the pressure valve to sealing and set the pressure cooker to “manual” for 7 minutes at high pressure. When the Instant Pot beeps, quick release the pressure valve. When the pressure is finished releasing, open the pot and add the spinach or preferred greens. Allow to cool and serve.